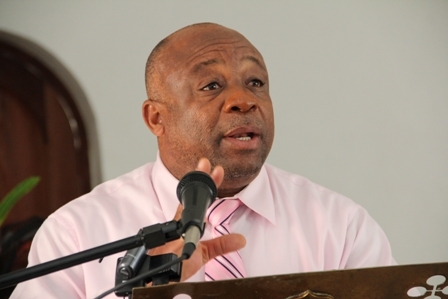 The Nevis Reformation Party is currently considering taking legal actions against the Supervisor of Election (SOE) Elvin Bailey for alleged irregularities in the electoral process including preventing people from registering to vote. Last week members of the NRP stood in front of the Electoral office in Charlestown to protest against the irregularities and also the supervisor not giving them a meeting to voice their concerns. The NRP’s candidate for St. Johns Hensley Daniel informed the Observer the party will be going to court if its issues are not resolved. “We will give them some time to response .Outside of that we have several other options .This time around we are going to go to the court. We are going to take legal actions on all those issues,” he said. Daniel said they wrote to Bailey requesting a meeting with him. “He subsequently wrote back and said that he has been advised by the commission that we should also invite the CCM (Concerned Citizens Movement). We find that to be most out of order. If I invite you to a meeting you are going to tell me to bring my opposition. CCM didn’t ask for a meeting. But he is assuming what CCM has in their minds we have in our minds. But even if they do we want a separate meeting. We are persisting on that,” he said. The Observer made an attempt to contacted Bailey to address the NRP’s accusation but was informed that he was not on island. Daniel noted a second discrepancy they are having with the electoral system, which are persons unable to register to vote. He noted that person have been going to the office and are being told that they cannot register because the machines are down. “People have been turned away saying the machines are not working. If you go to the office to get registered they should take the information manually and when the time comes to take the photograph and whatever electronically you call the people and have them come in a tighten up that part which couldn’t be done because of the malfunctioning of the machine,” he said. He continued “We can’t get to the point where machines determine everything. You have something on the computer but you also have a hard copy.” Daniel addressed their third issue with the electoral system as persons names have been removed without them receiving an objection letter. “Persons names have been removed from the voters list especially people living abroad. They were not served with any notice as requested by the last court ruling. They should be delivered the notice of objection by hand. So your name is off the list and notice reach to you. So you can be disenfranchised like that ,” he said. Daniel said that a second letter was sent to the SOE and had been made public but have yet to received a response from the SOE..